The excitement in the air is electric as the leaders round the last corner and head for the finish line. Your team has used cunning and skill to position themselves for the win, and that's when the rain started! 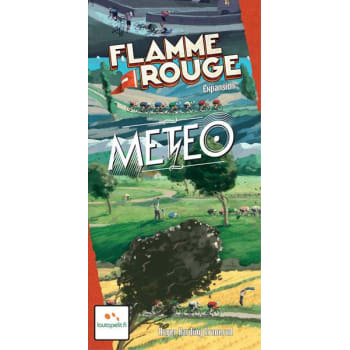 Flamme Rouge: Meteo is the second expansion for the popular, and award-winning, bicycle-racing game Flamme Rouge. Adding in realistic weather conditions like rain, headwind, and crosswind makes navigating the course far more challenging-and makes wrecks even more common! You've won some races, but do you have what it takes to compete in the rain and wind? Find out in Flamme Rouge: Meteo!